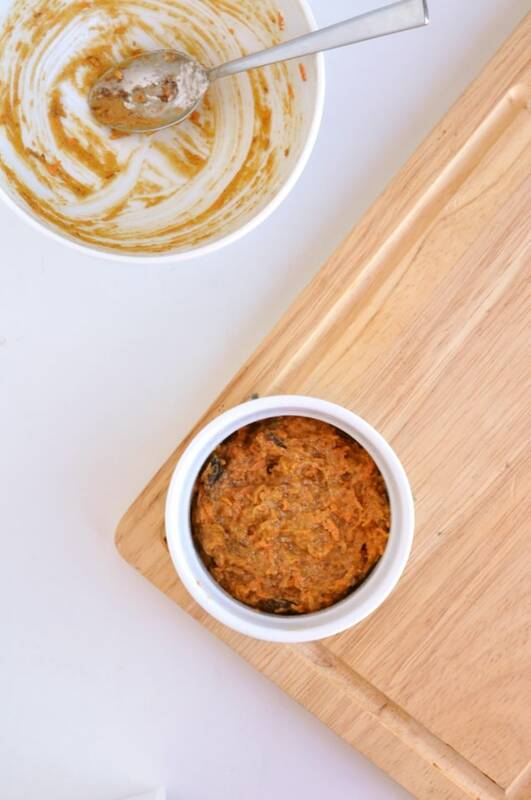 Just so we’re clear from the start, the healthy carrot cake mug cake in the photos was made in the oven. I’ve tested both the oven and the microwave recipes and honestly? My favourite is definitely the oven version. It’s got a proper cake texture, looks like a proper cake and even makes your house smell like a bakery when it’s in the oven. But sometimes you don’t want to wait 15 minutes for the oven to heat up, another 20 for the cake to bake, plus another 10 for it to cool down, right? Sometimes you just want to shove a cake in your face right this very second. That’s why the microwave version exists. Same ingredients, same taste, just not quite the same texture or look. But when you’re eating it at home, on your own, in your PJs, who cares? Wow, that scenario sounded a lot more sad on the screen than it did in my head, but I’m still saying it. My favourite thing about this healthy carrot cake mug cake? It looks absolutely adorable. If you follow all the steps in the recipe, go with the oven method and take the time to decorate it, you really will get a mini 2-layered cake. 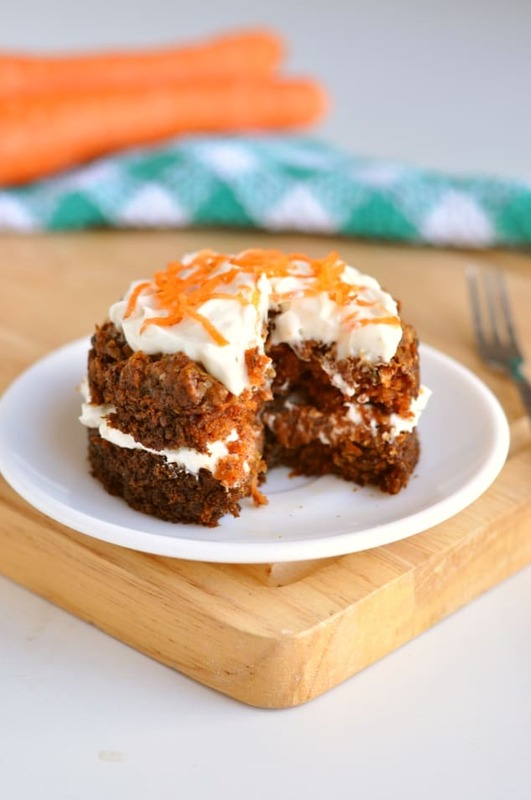 And this healthy carrot cake mug cake recipe genuinely makes one serving. Like, the cake you see in the photos is what you’ll get to eat for 200 calories. How cool is that?! I know a lot of people get disappointed when they find out that the “single serving mug cake” in the photos is actually made of 4x the ingredients. But not this mug cake. No siree. Want some proof as to how cute this healthy carrot cake mug cake is? My boyfriend has been remodelling the upstairs bathroom for…I don’t even know how long. He doesn’t want to take any time off work to do it, so he’s spending all his evenings and weekends doing it. He was swearing at the tiles (I’m 99% sure whatever it was, it wasn’t the tiles’ fault) so I popped in and showed him my cake in an effort to distract him. His expression instantly changed to a smile, he genuinely tilted his head to one said and said “Aww”. Then when I told him it was carrot cake, he went “Eww”, lost interest and got back to arguing with the tiles. He won’t touch vegetables in any way, shape or form. Unless they’re the dehydrated “peas” you get in a Pot Noodle. But I’m pretty sure they’re not really vegetables. 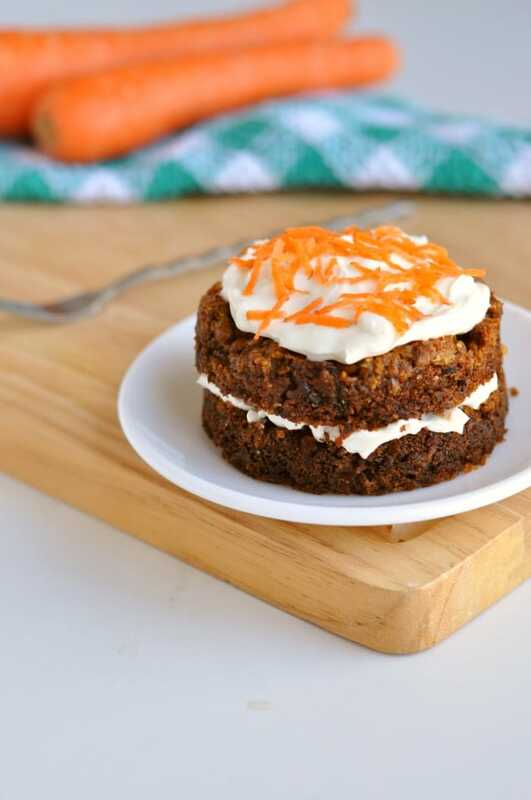 A light and fluffy carrot cake, studded with juicy raisins and kissed with yummy cinnamon, all sandwiched together with healthy cream cheese frosting. With a 20-minute oven recipe and a 2-minute microwave recipe, this healthy carrot cake mug cake is the perfect springtime dessert! If you're going to bake your cake in the oven, preheat it to 350F/175C. If you're going to steam it in the microwave, skip this step. Lightly grease a 1-cup ramekin and set to one side. In a small bowl, stir together all the cake ingredients (flour, cinnamon, baking powder, flaxseed, sugar, carrot, milk and raisins). Scoop into the greased ramekin. Oven: Bake in the preheated oven for 20 minutes, until golden brown and a toothpick, when inserted into the centre of the cake, comes out clean. Remove from the ramekin and leave to cool to room temperature on a wire rack before slicing in half horizontally. Microwave: Cook in the microwave for 60 seconds, or until springy to the touch. If the cake is still a bit soggy, continue microwaving in batches of 15 seconds until it becomes springy. Remove from the ramekin and leave to cool to room temperature on a wire rack before slicing in half horizontally. To make the frosting, in a small bowl beat together the cream cheese, milk, powdered sugar and lemon juice until smooth. Use the frosting to sandwich the cake halves together and spread a little on top. Use the grated decorate to decorate before serving. You can store the cake (frosted or un-frosted) inside a sealed container in the fridge for up to five days or in the freezer for up to six months. Hi, just found your site today when I was looking for a mojo recipe. I made the green one tonight and as there are only 2 of us I halved the recipe. It was gorgeous and so easy to follow and make. Your website is lovely and so inviting you just want to try all of the recipes they look so fresh and yummy. Thank you. Thank you so much Rachel! Your comment really made my day 🙂 I’m so glad you liked the mojo recipe. And great initiative halving it – a whole batch would definitely have been too much for two people! This sounds delicious! I am definitely a carrot cake lover and find it hard to believe that you weren’t one until now :). I love that you’ve made a healthier version, pinning to try. Thanks for sharing at What’d You Do This Weekend?! This is a smart idea so I don’t overate! LOL! Hi there! Stopping by from the Creative Inspirations link party. This looks so yummy and every once a in while, I crave carrot cake but don’t want to buy/bake an entire cake and carrot cupcakes are sometimes hard to find. Pinning for those moments! Thank you so much, Mariah! Your Mug Cake looks wonderful, I love the carrot cake. Thanks so much for sharing your awesome post with Full Plate Thursday and have a fantastic weekend! Only 2 T of liquid ingredients for 6T of dry ingredients Isn’t something missing.? Won’t the mixture be too dry? I can see why you’d think that, SK, but it really doesn’t! The 2 tablespoons of liquid are helped by the egg yolk and the grated carrot, which add to the moistness. If your batter is too dry, feel free to add a few drops of water or milk, but the recipe really shouldn’t need it. Where is the egg yolk listed on the ingredients? Thanks so much, Fiona. That’s why I love it, too! This looks delicious! I love healthy desserts. And you can’t beat carrot cake flavor. Thanks for sharing! Thanks so much, Lauren. I love healthy desserts, too! 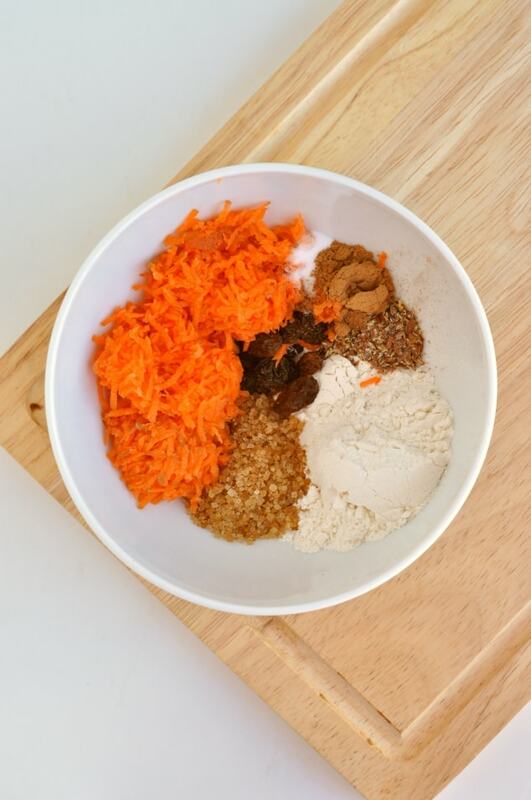 I love carrot cake but I’m with you – only when it’s been healthified 😉 This looks like an especially quick and easy way to get my fix. And I’ll definitely be having it for breakfast, as well as dessert! How delicious! What a great idea. Carrot cake really is a pretty good dessert when made this way. I LOVE a good mug cake, but have never tried a carrot cake one. That will obviously change – this looks AMAZING. Thanks so much, Kylee! 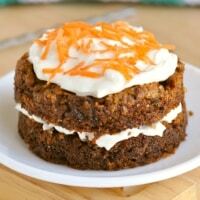 It’s perfect for when you love carrot cake but no one else in your house does! Carrot cake is my favorite, I am not making now a days because my kids won’t like them, I like your idea of single serving of this Carrot mug cake. I am enjoy without bothering about how to finish other cake. Yum. I keep seeing mug cakes and totally need to make one already! You haven’t made a mug cake yet? You DEFINITELY have to! They will change your foodie life!